Tree farms are productive ventures to ensure landscapers have the tools to create lovely, shaded lawns. Pine trees are a desirable addition to a tree farm because they attract scores of families and children who revel in the excitement of personally choosing their Christmas trees. Whether you are planting pine on your tree farm to sell for landscaping purposes or to cut for Christmas trees, the majestic beauty of these evergreens will be well worth the effort to establish the pines on your farm. Select an area on your tree farm to plant pine seedlings. Pick a spot with plenty of sunlight that is relatively flat. An old field or pasture will usually work out well. Avoid hilly or rocky areas. Do not plant near other taller trees on your farm, such as oak or maple. These need lots of room to grow and will compete with your pine seedlings. Choose an area that is close to the road if you plan to allow guests to visit your farm to choose their own trees. Plant your seedlings in late spring, approximately two weeks after the danger of frost. Load the plants onto a flat-bed trailer that is attached to your farm tractor. Separate the pine seedlings by species, with the taller plants at one end of the cart. Drive to the end of the field you have designated for planting your pine trees. Plant one species of tree per row. Start with the tree that will be the tallest at maturity so it will not shade the others as it grows. Dig a hole approximately 2 feet deep and 2 feet wide. You may want to use an auger if you are planting a large number of trees. Spritz the roots of each tree to moisten without soaking. 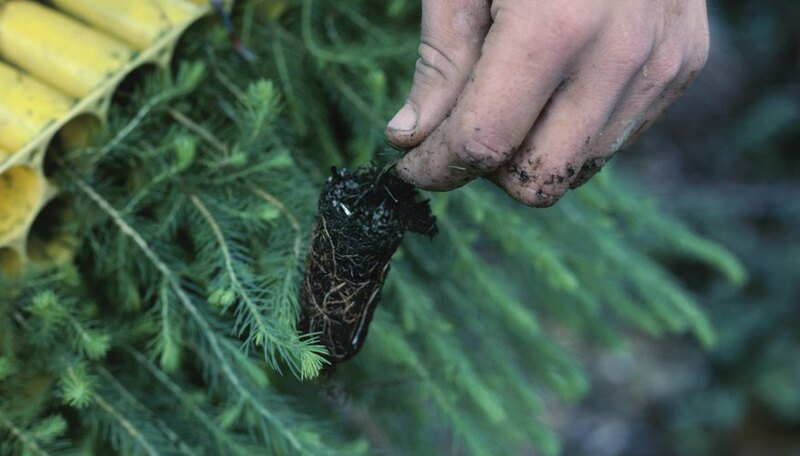 Place the pine into the hole and cover with soil to the base of the tree. Tamp the soil around the trunk. Continue planting in rows, leaving 6 feet between individual trees and 4 to 6 feet between each row. Leave a wide space around the perimeter of the trees for the movement of your tractor in and out of the area. An area that is 6 to 8 feet wide should be sufficient. Water each pine tree lightly after planting. Water them as needed throughout the summer months. This will depend on your climate, but most pine trees need little water after they have taken hold on the surrounding soil. A mulch, such as pine straw or raked leaves, may be added to reduce moisture loss, insulate the pine trees from the cold and prevent weeds from cropping up around young trees.